Among the most well known islands are Sumatra, Java, Bali, Kalimantan (formerly Borneo), Sulawesi (formerly Celebes), the Maluku Islands (or better known as Moluccas, the original Spice Islands) and Papua. Then, there is Bali “the world’s best island resort” with its enchanting culture, beaches, dynamic dances and music. But Indonesia still has many unexplored islands with grand mountain. 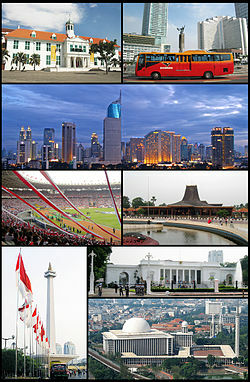 Jakarta, officially the Special Capital Region of Jakarta is the capital and largest city of Indonesia. Located on the northwest coast of the world’s most populous island Java, it is the centre of economics, culture and politics of Indonesia. Jakarta has five administrative cities which consist Central Jakarta, South Jakarta, West Jakarta, North Jakarta and East Jakarta. Jakarta has a tropical monsoon climate (Am) according to the Köppen climate classification system. The wet season in Jakarta covers the majority of the year, running from October through May. The remaining four months (June through September) constitute the city’s drier season (each of these 4 months has an average monthly rainfall of less than 100 millimetres (3.9 in)). Located in the western part of Java, Jakarta’s wet season rainfall peak is January and February with average monthly rainfall of 299.7 millimetres (11.80 in), and its dry season low point is August with a monthly average of 43.2 mm (1.70 in).